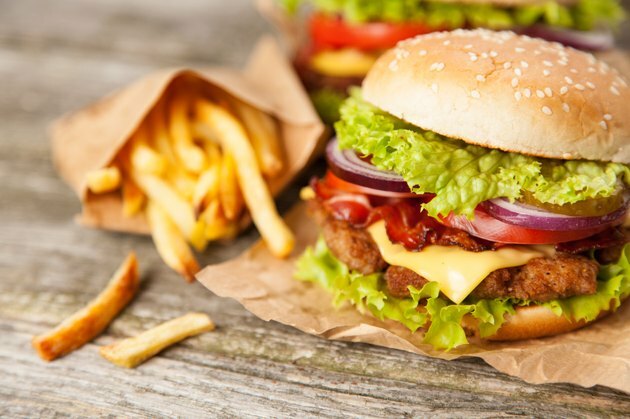 Eating unhealthy foods on a regular basis may contribute to health problems. Studies continue to show the negative effects of many common unhealthy food products. For optimal health and wellness, eat a balanced diet with plenty of fruits, vegetables and whole grains -- and save the empty calories for occasional treats. In addition to other causes such as inactivity and medical problems, obesity is also related to an unhealthy diet. Because you must burn more calories than you consume, a high-calorie diet combined with physical inactivity will most likely result in excessive weight gain. Foods that contain large amounts of trans fats, saturated fat and sugar all contribute to increased chances of obesity. For maximum health benefit, always eat breakfast and avoid skipping meals throughout the day to help regulate your metabolism and avoid unhealthy snacking. The quality of your diet has a significant impact on your cardiovascular health. Salt and fatty foods can be particularly detrimental when consumed in excessive quantities on a regular basis. For maximum heart health, Medline Plus recommends limiting salt intake to 2,400 mg each day. Other unhealthy foods to avoid include soda, butter, high-fat meats, organ meats and fried foods. Use skinless poultry whenever possible. Avoid eating more than three to four egg yolks per week, and always choose low or non-fat dairy products. Eating unhealthy foods also contributes to increased susceptibility to illness and chronic disease. Not only does a healthy diet help prevent heart disease, but it may also aid in the prevention of type 2 diabetes, osteoporosis and even cancer. An unhealthy diet may also cause nutrient deficiencies, which are particularly common in those who do not meet daily calorie requirements. According to the World Health Organization the most threatening nutrient deficiencies are iron deficiency anemia, vitamin A deficiency and iodine deficiency disorders. As noted by HelpGuide.org, diet plays a crucial role in mental health. Eating too much junk food may aggravate symptoms of mental illnesses such as depression and anxiety. Sugary foods and refined carbohydrates are particularly harmful, since they result in a rapid increase in blood sugar. Potatoes, brown rice, oatmeal and other complex carbohydrates are wiser choices. According to MayoClinic.com, unhealthy food choices and diet habits may also increase your chances of developing mental diseases like Alzheimer's later in life. What Happens When You Don't Eat Healthfully?